Ladies and Gentlemen, come on in and experience the fantastical, the sensational, dare I say cosmological and explorational, Carnival of Space, Number One Hundred Thirty-Six! We'll take you to the Moon, we'll fly through the stars, we'll go visit a friend on the surface of Mars. 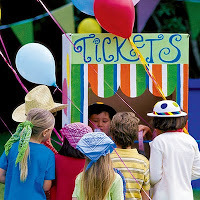 So scroll down the page, see what there is to see, the tickets are priced just right..they're FREE! Out of the Cradle has an excellent interview with a Russian team scientists working on sending a rover to the Moon as part of the Lunar X Prize contest. The prize will award US$20 million to the first team to land a robot on the moon that successfully travels more than 500 meters and transmits back high definition images and video. 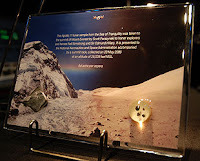 Collect Space has an interesting story of Moon rocks that have come to Earth from the Moon, traveled to the peak of Mt. Everest and will now end up in a plaque on the space station. Talk about a ride! Cumbrian Sky takes us to the surface of Mars to visit the Spirit rover. 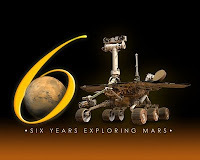 The rover has been on Mars for six years, so this blog is nice retrospective on what has happened in that time. Gish Bar Times introduces a series of articles over five days covering various topics related to the discovery of the Galilean moons. The Angry Astronomer blogs about a new, refined age of the solar system. It's not polite to ask a solar system how old she is, but the Angry Astronomer knows. Some of the most popular rides in the Carnival these days are rides to planets around other stars, known as extrasolar planets or exoplanets. Phil Plait (pictured here), at the Bad Astronomy blog writes about a potential way future scientists could detect water on planets by catching glints off the surfaces of lakes or oceans. The Slacker Astronomy podcast interviews Steve Howell, one of the Kepler mission scientists about the potential to discover asteroids around white dwarfs. There is also some light-hearted discussion of Ophiuchus, the orphan astrological sign. Some of the biggest stellar news came from the AAS meeting in Washington, DC. 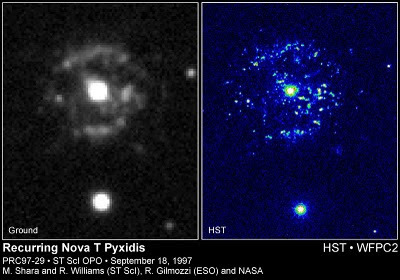 The recurrent nova T Pyxidis made headlines when astronomers claimed it may go supernova soon and endanger the planet Earth! Thankfully, cooler heads prevailed and the blogosphere helped to clear up misinformation spread by the print and news media. Next Big Future takes on the story published on Astronomy.com that states,"If a type Ia supernova explosion occurs within 1,000 parsecs (3,260 light-years) of Earth, then the gamma radiation emitted by the supernova would fry Earth, dumping as much gamma radiation (about 100,000 ergs per square centimeter) into our planet, which is equivalent to the gamma-ray input of 1,000 solar flares simultaneously. 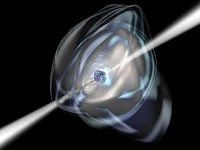 The production of nitrous oxides in Earth's atmosphere by the supernova's gamma rays would completely destroy the ozone layer if the supernova went off within 1,000 parsecs." Ian O'Neill at Discovery News Space points out several more articles published on the web creating unnecessary panic about T Pyx and the likelihood of a disaster on Earth caused from a supernova 3,260 light-years from us. Meetings like the AAS are key to the scientific process where theories are aired and results are open to academic scrutiny, sometimes it's better to wait until after the conference before reaching any conclusions." The Simostronomy contribution for the week talks about astronomers riding the waves of stars through asteroseismology. Stellar surfing, now there's a carnival ride to try out. Starry Critters takes us on a ride to the edges of time through the newest Hubble Space Telescope image of faint galaxies at the edge of the universe. The unique image viewer on this page is worth taking time to play with. This ride will have some of the longest lines at the carnival this week! The carnival also features a time machine ride this week! If we can only see distant objects as they appeared in the past, how do we know how far away they are now? Cheap Astronomy explains time and distance on this episode of 365 Days of Astronomy. Centauri Dreams, the blog about exploring the ways man will actually go to the stars, says one way we can go is to hitch a ride on a "cycler". We might use 'orbital cyclers' to get us around the solar system, or 'interstellar cyclers' to help us reach the stars, if we can just figure out how to push that much mass up to speeds approaching that of light. Speaking of the speed of light, Nancy Atkinson of Universe Today takes us on a ride through the carnival fun house with a faster than light pulsar phenomena that will bend your mind just a bit. Nancy assures us that no laws were broken in the process. 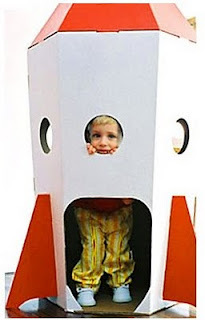 If there are to be laws in space, governed by some sort of moral code of behavior, Habitation Intention provides a place to start with the 10 Commandments of Space Habitation. Riding bravely into the future, Next Big Future discusses the possibility of ultra-dense deuterium. If it is shown to be stable long enough, it could be as important as the discovery of nuclear fission. My thanks to Fraser Cain at Universe Today for organizing the carnival and many thanks to the bloggers who gave us a ride through the solar system, stars, time and the cosmos. I hope you enjoyed the Carnival of Space this week, thank you for stopping in. loved your posting... keep it this way.